There was a frantic scurry among the Palace servants when orders were received from the Queen that a twenty-four-foot giant must be seated at breakfast with Her Majesty in the Great Ballroom within the next half hour. The butler, an imposing personage named Mr. Tibbs, was in supreme command of all the Palace servants and he did the best he could in the short time available. A man does not rise to become the Queen’s butler unless he is gifted with extraordinary ingenuity, adaptability, versatility, dexterity, cunning, sophistication, sagacity, discretion, and a host of other talents that neither you nor I possess. Mr. Tibbs had them all. Everything, Mr. Tibbs told himself, must be multiplied by four. Two breakfast eggs must become eight. Four rashers of bacon must become sixteen. Three pieces of toast must become twelve, and so on. These calculations about food were immediately passed on to Monsieur Papillion, the royal chef. To Tibbs’ consternation, eight eggs weren’t enough to put a dent in the giant’s appetite; even seventy-two eggs weren’t enough to satisfy him. What was Tibbs’ mistake? And how many eggs should he have offered the BFG? If stomachs were spherical, we wouldn’t be able to draw such a simple picture; there’s no way to pack 64 spheres of radius 1 into a single sphere of radius 4. Still, the formula V = (4/3) π R3 governing the volume of a sphere of radius R tells us that when you multiply R by 4, you multiply V by 43, or 64. In the case of a stomach-shaped stomach, there’s no way to pack 64 unit stomachs into a stomach 4 times as large in every direction, and there’s no simple formula for the volume of a stomach, but we can nonetheless be certain that if you scale up a stomach by a factor of 4 in every direction, you multiply its volume by 43. Putting it differently: There actually is a simple formula for the volume of a stomach, of the form V = C R3, but C isn’t a mathematical constant like π — it’s a quantity that you’d have to determine empirically (and probably messily). What we see at work here is the concept of geometric similarity and the way volume scales with size. When two bodies are geometrically similar, so that the larger one is just the smaller one magnified by some scaling-factor s, then the volume of the larger is equal to the volume of the smaller multiplied by s3. 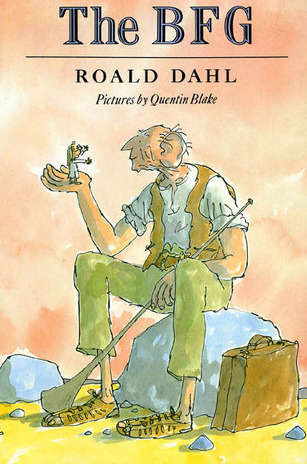 If the BFG is proportioned like the average human male but is four times as tall, with femurs that are 4 times as long as ordinary human femurs and 4 times as wide and likewise for all his other bones and organs, then his stomach will have four-cubed times the volume of an adult human stomach, so he’ll want 64 times as many eggs as your typical diner-denizen. 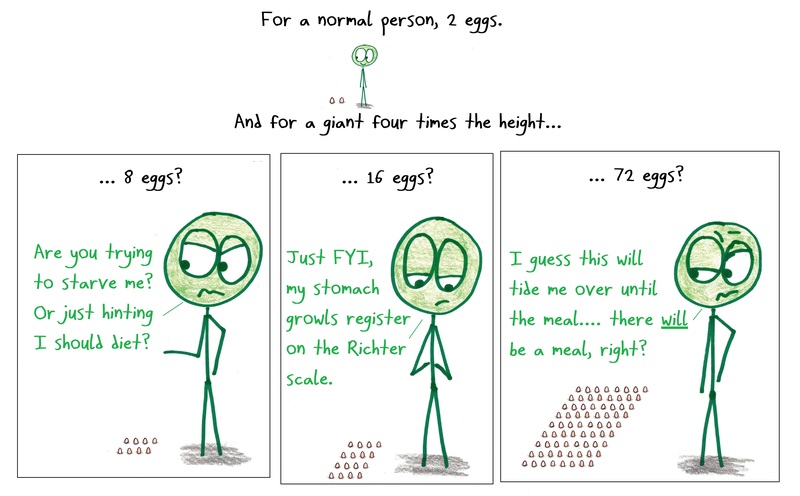 That is, 2 × 64 = 128 eggs (which is more than 72). From what has been already demonstrated, you can plainly see the impossibility of increasing the size of structures to vast dimensions either in art or in nature … It would be impossible to build up the bony structures of men, horses, or other animals so as to hold together and perform their normal functions if these animals were to be increased enormously in height; for this increase in height can be accomplished only by employing a material which is harder and stronger than usual, or by enlarging the size of the bones, thus changing their shape until the form and appearance of the animal suggests a monstrosity. 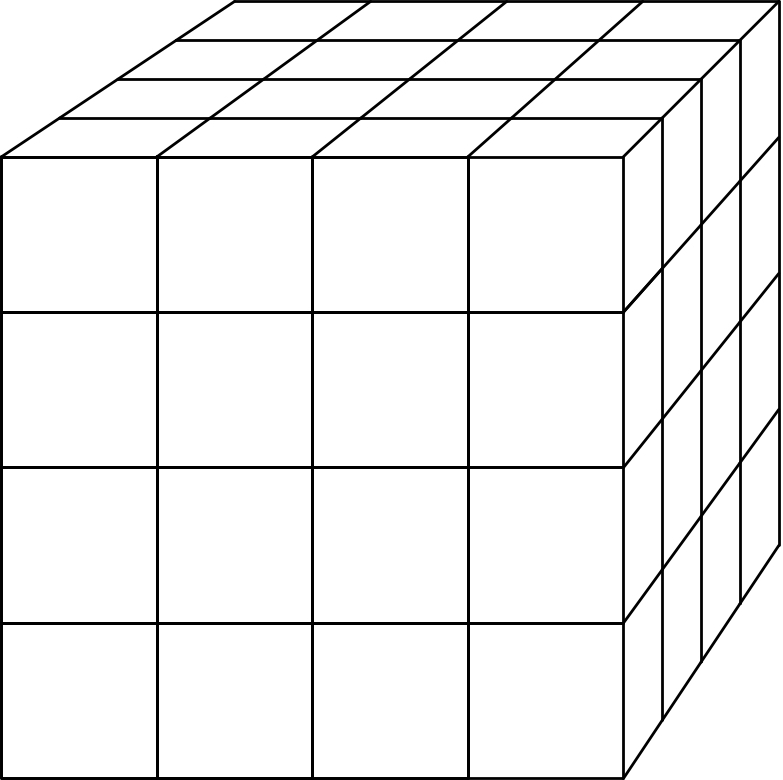 The problem with a horse scaled up by a factor of s is that its weight would scale like its volume, that is like s3, whereas its ability to support itself would grow like the cross-sectional area of its legs, which scales like s2. Now s2 is big, but it can’t keep pace with s3; if a horse the size of a Trojan horse tried to run, its legs would break instantly. The same issues would affect scaled-up human beings. To avoid these problems, an evolutionarily successful giant hominid would have to be very squat and round — more like the Incredible Hulk than Blake’s graceful BFG (let alone Ben Orlin’s stick-figure giant). A precise version of Galileo’s insight was proposed by the engineer-biologist Tom McMahon, one of my favorite teachers back in college. Like Galileo, whose views on scale encompassed both the natural world and the human-made world (or what Galileo calls human “art”), McMahon saw no clear dividing line between the two realms. For him, the body was a precision-engineered machine, constrained by physical law and sculpted by the forces of natural selection in the direction of maximal efficiency. Consider gait: when you plant one foot and swing the other leg forward, the motion of that swinging leg is as much governed by ballistics as it is by the muscular effort involved. As far as gravity is concerned, in that moment you are just an inverted pendulum. That’s from page 124 of On Size and Life, cowritten by McMahon and John Tyler Bonner; here means “d is proportional to ℓ to the 3/2 power”, and (for those unfamiliar with fractional exponents) ℓ3/2 equals the cube of the square root of ℓ (it’s bigger than ℓ but smaller than ℓ2). 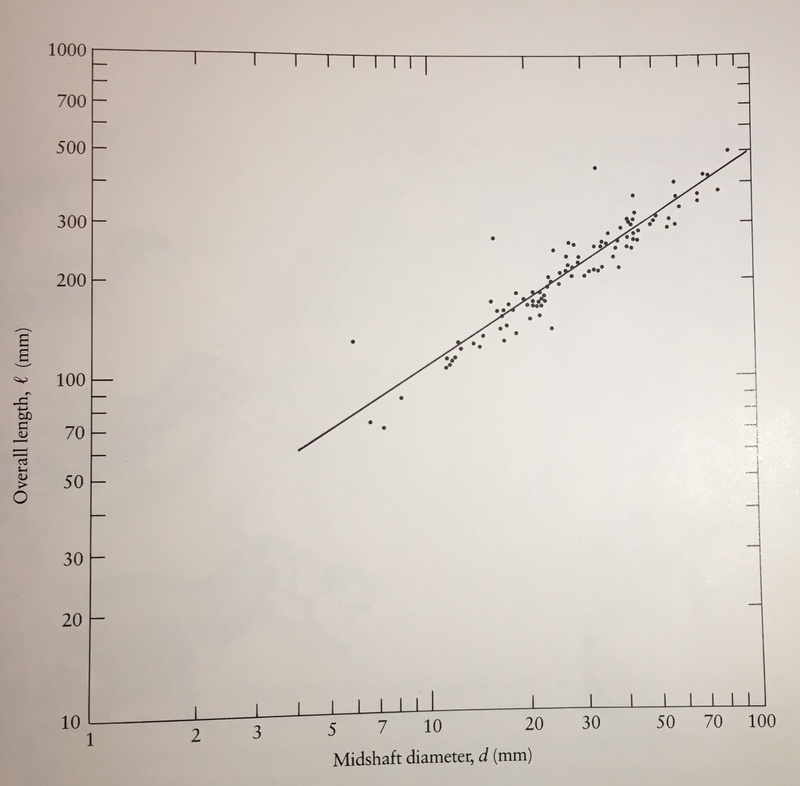 Page 125 (reproduced below) shows a log-log plot of the longitudinal and transverse dimensions of the humerus bones of a series of antelopes ranging from 3 kilograms to 750 kilograms, and the data-points lie beautifully close to an ideal line of slope 3/2; d does indeed appear to grow like ℓ3/2. From page 125 of “On Size and Life” by John Tyler Bonner and Thomas McMahon. A BFG constructed according to the principles of elastic similarity would have femurs, tibias, etc. that are four times as long as their normal human counterparts but a full eight times as wide. Squatness of individuals limbs translates into overall squatness of the torso, so we might expect the BFG, although four times as tall as the average human, to be fully eight times as wide from side to side and eight times as deep from front to back. So assuming his body is made from the same protoplasm as normal humans — just more of it — he’d weigh 4×8×8 = 256 times as much as a normal human. 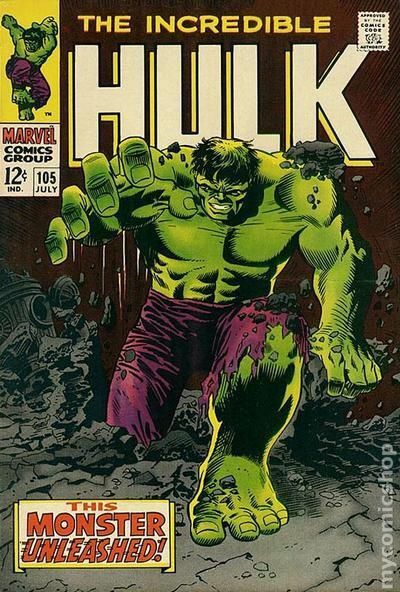 So, does that mean that a Hulk-like BFG should have 2 × 256 = 512 eggs for his breakfast? Let’s put all the pieces together. Under McMahon’s theory of elastic similarity, a hominid who’s 4 times as tall as us would be not 43 times as heavy (as would be the case for geometric similarity) but 44 times as heavy. At the same time, by Kleiber’s rule, the hominid’s metabolism would run slower than ours, so the weight-factor of 44 would correspond to a food-intake factor of only (44)3/4 = 43. Hence the BFG needs just 2 × 43 = 128 eggs after all! The preceding section owes a large debt to the short section of McMahon’s book (less than a page long) captioned “Feeding Gulliver”, in which he brings a biomechanical eye to the passage of Jonathan Swift’s Gulliver’s Travels that depicts the Lilliputian scientists’ debate about how much food and drink to give their guest. McMahon points out that, by assuming geometric similarity and ignoring metabolism, the Lilliputian scientists made two mistakes that happened to cancel each other out. The idea of tiny people was certainly not original with Swift, and other authors have put their own spin on the theme; I remember from my own childhood, with great fondness, Mary Norton’s book The Borrowers and its sequels. Most creators of these works ignore the issue of scale, though the Ant-Man franchise (with numerous comic books and a movie) at least tips its hat to the biomechanical fact that ants are capable of feats of strength impossible for the lumbering likes of us. If you think I’m about to score easy points by pedantically pointing out ways in which the movie ignores what it would really be like to be tiny, well of course I will. For instance, why aren’t the tiny people’s voices higher-pitched? Vocal chords are oscillators, and their frequency should get higher when they’re smaller. For that matter, the tiny people’s hearts should beat incredibly fast; that should be the first thing Damon’s character Paul Safranek notices when he wakes up, before he even has a chance to worry that one particular part of his anatomy might no longer be scaled geometrically relative to the rest of him. Paul thinks that by shrinking his body and stretching his dollars he can spend the rest of his years in retirement, but what kind of leisure activities does he have in mind? If he wants to swim, he might be distressed by the increase in water’s apparent viscosity. If he wants to play golf (presumably miniature golf, played with a mini driver), he’ll find that the feel of swinging a club is totally different from what he remembers. He might enjoy sports that involve running, because his new itsy-bitsy-ness would make it easy for him to sprint at speeds that, relative to his height, appear super-human. But sooner or later it would occur to him that this kind of turbo-charged sprinting, viewed from above, resembles nothing so much as scurrying. And in washing up after his exertions, he’d find it harder to get clean because of the increased effect of surface tension. Maybe Paul doesn’t notice these changes because he’s become stupider. After all, he’s got fewer neurons now. Or does he have smaller ones? It’s unclear that down-sizing individual cells makes sense, given the nature of cellular machinery. But if there were smaller neurons, they’d probably be stupider too. I haven’t used the word in this essay so far (except in the title), but Death has been lurking in the background all the way through, via the theory of natural selection. If your progenitors a million years ago had not used the minimum possible muscular effort when running away from predators, thereby enabling themselves to keep running longer, they would ended up as cougar-kibble, leaving the planet to more calorically frugal hominids. Whenever you think about how well-suited the human body is to the human mode of life, you should offer silent thanks to your ancestors’ less well-endowed rivals who unintentionally did you the favor of getting out of your ancestors’ way. The non-survival of the not-fittest is a key part of the evolutionary picture. And of course the poster children for non-survival are the giant dinosaurs who died off by the millions at the end of the Cretaceous period, leaving the field free for the small mammals who gave rise to us. The juxtaposition of the two preceding paragraphs might lead us to the preposterous idea that what killed off the big dinosaurs and let small mammals survive was an event of exactly the kind that Haldane described: big animals died, and small animals survived, because they all fell down. Oh, did you want to know how it could possibly have happened that all creatures great and small fell (some falling to their deaths) at roughly the same time, millions of years ago? You’ll just have to watch the video of my talk. This essay is dedicated to the memory of Thomas McMahon. Thanks to Sandi Gubin, Brian Hayes, Mike Lawler, Brent Meeker, Mike Stay, and James Tanton. Next month: Roasting a Dodo and Biking on Mars: The Magic of Dimensional Analysis. #1: Roald Dahl knew that sometimes the dictates of story take precedence over the dictates of science. Consider his book James and the Giant Peach. At one point in the book, five hundred seagulls carry the Giant Peach (“The GP”?) over the ocean. But even as a child I knew five hundred ordinary seagulls wouldn’t be enough. I’m not sure how many it would take. What do you think, readers? One might also consider the possibility of Birds Of Unusual Size (cf. Rodents Of Unusual Size), of which the horse-sized duck is a famous example. #2: Perhaps Mr. Tibbs, as a mere butler, should have passed the question of portion-size on to the chef, Monsieur Pappillion. At the very least, the chef would probably have been aware that some allometric relationships are non-obvious. The example of cooking a bird springs to mind; as I’ll discuss next month, the cooking time for a bird is proportional neither to the length nor the volume of the bird but rather to its surface area. #3: One feature of elastic similarity is that it predicts an upper limit on how big an animal adhering to a specific body-plan can be. Consider what happens when limb-diameter d exceeds limb-length ℓ. Do you get a pancake-shaped creature with pancake-shaped arms and legs? At some point, the spatial relationships between one body part and another make it impossible for each of them to change shape in the fashion dictated by elastic similarity. I like to imagine the sorts of creatures that brush up against the limits of elastic similarity — Galileo’s “monstrosities”. I’m reminded of the old song “Mister Five by Five”, as well as the famous spherical cow and the less famous spherical horse. Wikipedia’s explanation of the relationship between brain-size and body-size in its article on the Encelphalization quotient. The Frontiers in Neuroanatomy article “When larger brains do not have more neurons: increased numbers of cells are compensated by decreased average cell size across mouse individuals” by Herculano-Houzel, Messeder, Fonseca-Azevedo, and Pantoja. The Discover article “How tiny wasps cope with being smaller than amoebas” by Ed Yong. I found the third one quite amazing. #6: On page 14 of Why Size Matters, Bonner says that the Lilliputian scientists didn’t make the right call when they scaled up Gulliver’s food and beverage rations by a factor of height-cubed. Specifically, he says that the amount of wine they gave him would would have made him extremely drunk. This seems to contradict what McMahon writes. Can anyone explain this to me? I’ve asked Bonner, but haven’t received an answer as of this writing. And McMahon, alas, is no longer among the metabolizing. Perhaps intoxication is governed by a different allometric exponent than the slower process of digestion? An experiment in which pizza and beer are fed to undergraduates of various different sizes might do much to resolve the question. It could also win the experimenter an IgNobel Prize, or at the very least the adoration of the students at her institution. #7: After you’ve seen my BAHFest talk you might enjoy the text of an interview in which I answer questions about my presentation. John Tyler Bonner, Why Size Matters. This elegant little book covers a lot of the same ground as the longer book with McMahon. John Tyler Bonner and Thomas McMahon, On Size and Life. Great writing and beautiful pictures. Roald Dahl, The BFG. If you’ve read the book, you’ll recall that the BFG isn’t even the largest hominid on our planet; he is called “Runt” by bigger (and not at all friendly) giants. Also, the BFG has the ability to fly by magical means that lie wholly outside the purview of speculative biomechanics. Roald Dahl, James and the Giant Peach. You have to love a book that kills off the protagonists’ parents in such a bizarre and off-handed fashion in the first two pages. Galileo Galilei, Dialogues Concerning Two New Sciences. Most scientists content themselves with founding at most one new science per book, but not Galileo. D’Arcy Wentworth Thompson, On Growth and Form. The chapter “On Magnitude” is a masterpiece. Geoffrey West, Scale: The Universal Laws of Growth, Innovation, Sustainability, and the Pace of Life in Organisms, Cities, Eonomies, and Companies. I haven’t had a chance to read this ambitious book yet, but at least I’ve borrowed it from the library, which is a start. This entry was posted in Uncategorized on January 16, 2018 by jamespropp. How drunk you get depends on the rate of alcohol absorption rather than the absolute amount of alcohol consumed, and absorption happens through the wall of the small intestine, which scales only as s². What I’m not sure about is what happens to alcohol elimination, which I would think would scale according to the size of the liver, presumably s³. So maybe Gulliver would get very drunk but sober up fast.